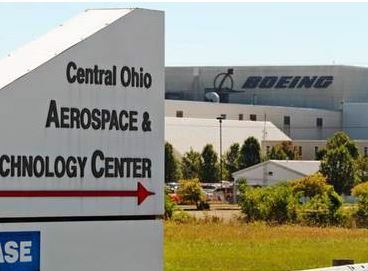 The Central Ohio Aerospace & Technology Center is Central Ohio’s premiere rail-served industrial campus with a focus on advanced materials manufacturing. The property is among Ohio’s top five largest concentrations of the aerospace and defense industry. Combined, the employers at the Aerospace Center employ over 1,200 people. The property is located in Heath, Licking County, Ohio. 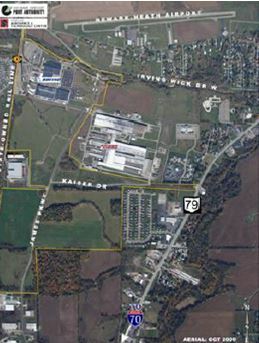 The manufacturing and technology-based campus is fully-served, including redundant public infrastructure and the property includes 200 acres of rail-served property along the state-owned Panhandle rail line with service by Ohio Central Railroad and open access to NS, CSX, and other carriers. The 350-acre Central Ohio Aerospace & Technology Center is a combination of the original 57 acres acquired from the Air Force as part of the privatization of the former Newark Air Force Base in 1996, The Base Campus, as well as 290 acres acquired in 2002 as part of a planned expansion, the South Campus. The site is located amidst the 79|Seventy Advanced Materials Corridor, the largest manufacturing corridor in Central Ohio. The location has been a magnet for manufacturing for decades because of a stable, skilled workforce available nearby. COATC is located approximately 25 minutes from Port Columbus International Airport, and approximately 2 minutes from Newark- Heath regional airport. American Electric Power provides triple redundant 69KV electric power to the site with redundant substations and 39.5KV secondary service also available. The Energy Cooperative’s natural gas service has unmatched capacity and is through an 8-inch high pressure main line on site along with a 4-inch service line. Windstream has existing telecommunications service with nearby access to fiber optics. Century Link is adjacent to the campus to the South, offering opportunities for redundant telecommunications. The City of Heath provides water and sewer services to the campus, including looped water lines. The Aerospace Center is bordered by a state-owned rail line which is operated by the Ohio Central (part of the Genesee & Wyoming system) and includes two existing, active spurs accessible to Aerospace Center available sites. Open access rail service is made possible by state ownership and the close proximity of trackage rights held by CSX and Norfolk Southern railroads. The property is located off State Route 79 and is just five miles from Interstate 70 and three miles from four-lane State Route 16. 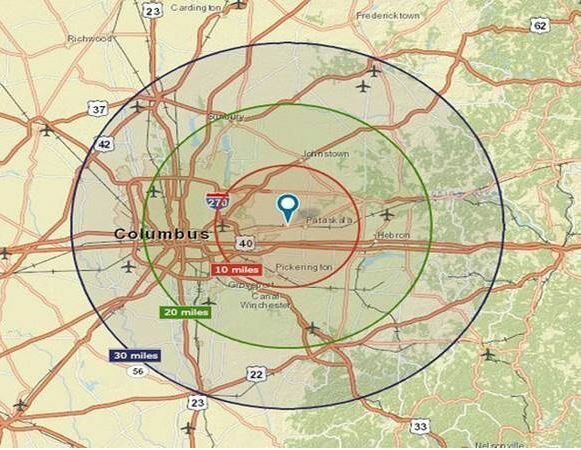 Port Columbus International Airport is 33 miles to the West and Rickenbacker Airport (a cargo-only facility) is 37 miles southwest. Both Norfolk Southern and CSX are located in close proximity with intermodal container freight facilities. Indeed, both rail carriers are underway with multi-million dollar facility upgrades at their Columbus yards. Additionally, the city offers employers a new income tax rebate incentive. City-owned water and sewer service are available at competitive rates. Additional state incentives can be coordinated and integrated into a comprehensive incentive package. The City of Heath offers a “hassle-free” 100%, 15-year tax abatement on new buildings constructed on the COATC campus. Creative financing structures are available, through the Heath-Newark-Licking County Port Authority. Heath city elected and administrative officials have earned a well-deserved reputation for being business-friendly. 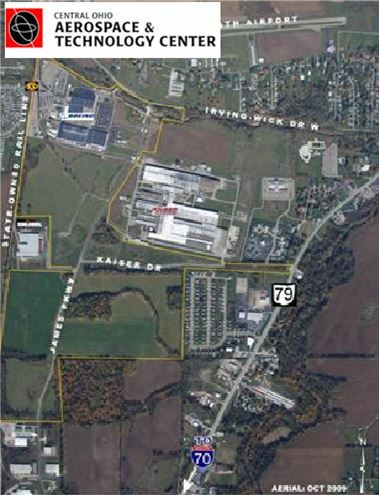 Located southeast of the intersection of State Route 16 (Broad Street) and Mink Street along Etna Parkway in the city of Pataskala, the Pataskala Corporate Park is one of the premier manufacturing and corporate park development sites in Central Ohio. The park’s location, between State Route 161 and Interstate 70 in the growing eastern gateway area of the Columbus Region, allows for excellent transportation access from multiple directions providing a large skilled workforce from Licking and Franklin counties. The location of the park is unmatched, relative to the level of access to interstate, major highway, air and rail transportation systems. Excellent roadway access to I-70 and I-270 is coupled with rail spur service capability for freight carriers with connections to both CSX and Norfolk Southern Railroads is possible. The 296+ acre Job Ready Site is part of a 520+ acre Park and is an ideal location for manufacturing, logistics, science and technology, corporate headquarters and professional facilities. 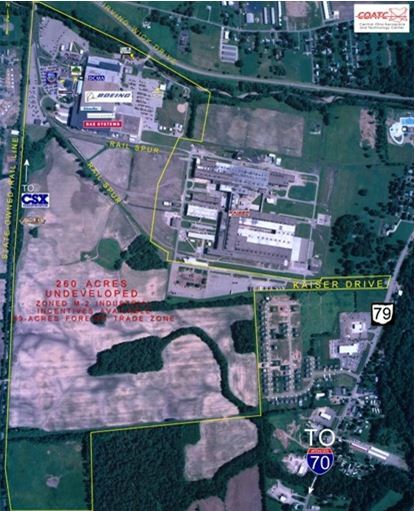 The site is located in an Ohio Enterprise Zone, Joint Economic Development District (JEDD), a Tax Increment Financing (TIF) District, as well as a Community Reinvestment Area and has both state and local incentives available to support new development. The Austin Company completed the certification review and confirmed that the Pataskala Corporate Park meets the requirement to be designated as a Certified JRS Manufacturing site. 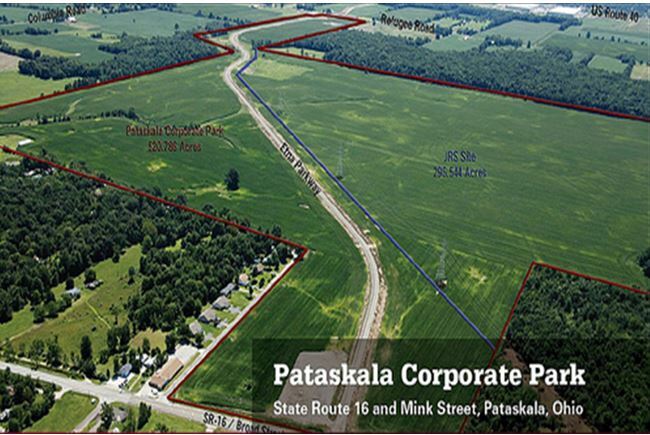 The Pataskala Corporate Park is located in Western Licking County, providing easy access to Columbus, Licking County, and the entire region. This area has been a location of choice for manufacturing, assembly, and logistics for decades because of Licking County’s stable, skilled, multi-disciplinary workforce. The Pataskala Corporate Park Job Ready Site is located along Etna Parkway, located south and east of the intersection of SR 16 (Broad Street) and Mink Street, in Pataskala, Ohio. This 296- acre Certified Job Ready Site + additional acreage provides a variety of development options. All utilities, with capacities suitable for industrial users, available at site. Rail service may be extended to the site. The property borders a major east-west regional arterial (SR 16) and is less than two miles from I-70. This proximity to one of the Nation’s major east-west interstate corridors offers easy access to Pennsylvania, Indiana, and West Virginia. The Park also has easy access to I-270 and I-71. All utilities – gas, water, sewer, electric – are available at the project site. American Electric Power Ohio provides 6+ MW capacity to the site, with a138 kV transmission line at the site’s southern boundary and a 34.5kV service on site. Natural Gas is provided by The Energy Cooperative through a 6-Inch steel-coated line, with 150 psig that can be increased to 475 psig. Century Link has service capacity to the park, with the ability to deliver comprehensive voice and data telecommunications service. Other telecommunications carriers also serve the area, offering opportunities for redundant telecommunications. The Southwest Licking Community Water and Sewer District provides water and sewer service to the park, through a 16-inch water line, and both a ten-inch and eight-inch sanitary sewer line. The Pataskala Corporate Park is not located within a federally-designated floodplain. The Pataskala Corporate Park offers its users a number of potential cost-saving opportunities, through its inclusion in several incentive designations. Tax incentives are available through one or more of the following. Community Reinvestment Area (CRA) offers users 100%, 15-year real property tax abatement. Enterprise Zone Incentives offer users 10-year real property tax abatement. Tax Increment Financing (TIF) District affords the opportunity for collaborative infrastructure and site-related improvement financing. 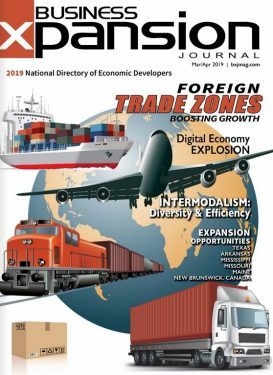 Foreign Trade Zone (FTZ) Eligible, reducing tax liability for exporters. A pro-active, pro-business local city organization. GROW LICKING COUNTY COMMUNITY IMPROVEMENT CORP.